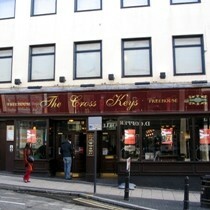 The Crosskeys in St Albans is a Wetherspoons pub in a central location. Usual choice of five or six standard real ales (Spitfire, Abbott, Courage Best & Directors, Pedigree) and often guest beers are available. Regular beer festivals when there could be four guest ales on. Very good value, many beers less than £2. Popular with youngsters early in the evening getting cheap drinks before going to a club. Majority of drinkers are men. Rather dark interior. Variety of food is good and generally excellent value - served all day from breakfast at 10am until 10pm. Curry evenings on Thursday. No music. Popular with the more elderly drinkers at lunchtimes getting good value food and drinks. Plenty of seating is available at the front and back. As usual with Wetherspoons pubs the toilets are clean and regularly inspected. Service can be slow if you arrive at the peak time which in here appears to be around 9pm. Doormen at the weekends try to ensure no under age drinking and generally maintain order. The plasma screen does not show live sports, it appears to be permanantly tuned to Sky Sports News. Wi-Fi access is provided by The Cloud. To close soon. Wetherspoons to concentrate on Waterend Barn. Closed as a Wetherspoons but still trading with temporary owners - no real ale and cash only. New pub chain due to take over in July/Aug 2012. To open in August as a smart restaurant and bar called Bar Baroque.